Background. Main use of 177Lu-PSMA-617 radioligand therapy has been for patients with multiresistance to most established drugs for treatment of metastatic castration resistant prostate cancer. In a recent study of patients with 177Lu-PSMA-617 RLT of 46 patients with only lymph node metastases, more than half of the patients had PSA progression during f -up. Here we summarize two patients who underwent a second course of cycles of treatment with 177Lu-PSMA-617 RLT at PSA progression. The first case had PET/CT summer 2016 that showed lymph node metastases inclusive a mediastinal lymph node. 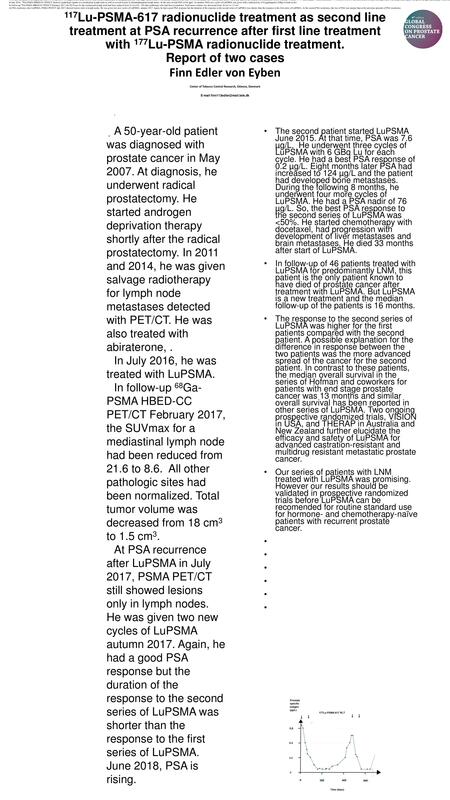 He had two cycles of 177Lu PSMA July and September 2016 and obtained a partial remission leaving only one lymph node positive site at follow-up. From summer 2017 PSA was rising, and he had a second course of 177Lu-PSMA-617 RLT October and December 2017. From February 2018 PSA had declined to unmeasurable values and a restaging PSMA PET/CT showed no evidence of metastatic lesions. So, he had PSMA PET/CT complete remission. The second case had the first series of treatment June 2015. After initial PSA response the patient had relapse March 2016 with mediastinal lymph node and bone positive sites on PET/CT. From Spring to Autumn 2016 he had five new cycles of 177Lu-PSMA-617 RLT. He had a partial PSA remission but progressed. June 2017 he was treated with docetaxel. Despite that he progression with multiple bone and liver metastases. In February 2018 he developed brain metastases and died 33 months after start of 177Lu PSMA 617 RLT. Discussion. Patients who progress after the first series of 177Lu-PSMA-617 may respond to a second course of treatment. The effect a retreatment may depend on the extent of metastases at the time of the second course with best outcome for patients who still have only lymph node metastases at the time of retreatment.